It's that time of year to get your outdoor sports gear organized and ready to use. If you're lucky enough to have a storage option right at the water's edge, check out the outdoor dock, deck, pier and marina racks we've got for kayaks and paddleboards. 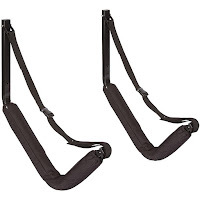 These will save you the trips back and forth lugging your heavy boats around, saving you more strength for paddle strokes. A key with outdoor storage racks is that they must be made of heavy duty materials, finished with an appropriate coating to hold up to outdoor exposure, and include installation and mounting hardware with the same weather proof resistance. Some of the best outdoor storage option materials are aluminum, powder coated steel, stainless steel, or galvanized steel. We rate most of our outdoor racks as freshwater storage (aluminum, powder coated steel) or saltwater storage (stainless steel, galvanized steel). Saltwater Kayak Rack or Saltwater Paddleboard Rack: these 2 racks are made from the same materials, with a different design, either a U-shape for SUPs or an open wall hook for kayak storage. 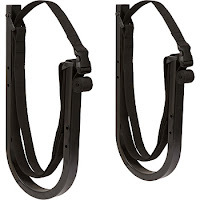 The racks are black, heavy duty steel with a galvanized finish for outdoor use in saltwater environments. That makes them great for your dock or deck, whatever body of water it's situated on. Easy to install to a wall surface, your dock or deck posts, and includes weatherproof mounting materials, too. Kayak and Paddleboard Dock Mount Rack: this is a serious, top of the line dock storage solution for up to 5 kayaks and paddleboards. It's made of 1-1/2” diameter, 304 marine grade mirror polished stainless steel tubing with 356 anodized aluminum connection joints! That may be a mouthful, but it means it's weatherproof for outdoor use on your dock or deck. 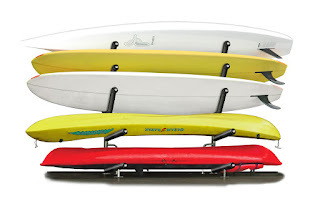 This rack is customizable with flat arms (for kayak storage) or angled arms (for SUP storage) - you choose the arrangement you need to fit your water sports gear. SUP Rack for Docks and Piers: this rack is a real breakout hit because it's so easy to use, yet so incredibly weatherproof. 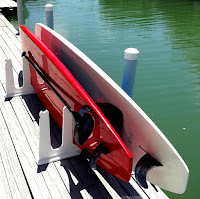 The rack itself is a floor rack - mount the two pieces at whatever distance you need on your dock or deck or pier or marina - and slide your SUPs in horizontally. It comes in black or white and in versions to store 1, 2, or 3 paddleboards, so customize it to what you need. If you have wider SUPs, there's also a Race or Touring Dock Rack version for you! Finally, it's made of zero maintenance, King Starboard marine grade heavy duty plastic; it's built to last outside.